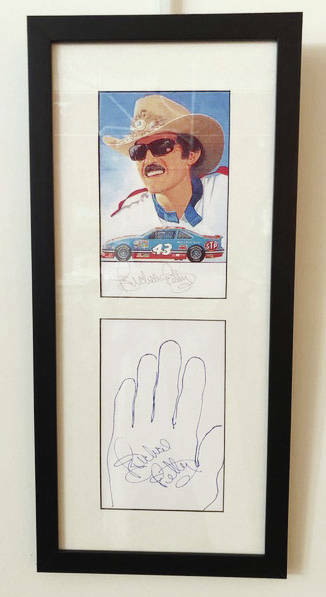 This donated artwork from professional race car driver Richard Petty will be part of the “Bad Art by Good People” auction on March 1. The annual “Bad Art by Good People” fundraiser for the Champaign County Arts Council is accepting donations and votes. Each year, local people from all walks of life volunteer to create art for the tongue-in-cheek contest. This year’s artists are Kerry Brugger, Chad Miller, Stephen McCall, Audra Bean, Lyndsey Murphy, Brad Winner, Brian Nicol, Michele Stokes, Heather Brackney, Blair Stinson, Vicki Deere-Bunnell and Heather and Ryan Hostetler. A donated piece of art from professional race car driver Richard Petty is also part of the fundraiser. The piece was obtained for the fundraiser by Urbana Daily Citizen Sports Editor Steve Stout and it will be part of the dinner and auction held on Friday, March 1, from 6 to 10 p.m. at the Arts Council’s office and gallery at 119 Miami St. in Urbana. Tickets are available for the dinner and auction for $25 each. Live bidding on the art pieces will take place on March 1. Watch the Urbana Daily Citizen during the weeks leading up to the dinner for profiles on each artist and photos of the artists with their creations.